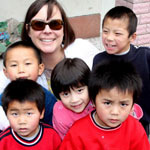 When we went to China in 2006 to bring Katie Mei home, we had two fantastic guides from our agency, All God's Children. The first was a seasoned veteran, Angela, and the second was a young gal who was in training, Annie. We quickly grew to love both our guides, but found a special place in our heart for sweet Annie. She was new to the job, had traveled very little before, quietly and graciously served our family and was a general joy and delight to get to know. Annie lived at the GM Orphanage where we had sent our Knitting Project scarves to and she was able to tell us so much about the children in the photos! We loved spending time with Annie, knowing she lived and served the children we had fallen in love with through scarves and pictures. Annie clearly loved the Lord, loved her new job, and loved serving children and families. She was quiet and her English was broken much of the time, but she graciously shared with us about her family, about herself, about her future goals. Towards the end of our trip, Annie took us to the zoo for a day of relaxation. Annie had never been to a zoo. She had never seen many of the animals that were so common to us. In fact, at her request, we walked by the elephant several times because she was so amazed to see one in real life! She and I took a picture by the elephant so she could take it back to the kids at GM Orphanage and share with them what she saw! When Kelsey and I went to China this past April we took along a small photo album of pictures of our family and friends. I included this picture of Annie and I in the photo album in case anyone at the orphanage remembered Annie and could give us an update on her. Not only did the director of the GM Orphanage remember her . . . he called her on the phone and passed it over to me! Within seconds I was talking with my dear friend Annie . . . reminiscing over our trip and updating her about families we had traveled with! What was even better was that Annie promised to take a taxi over to the orphanage on Sunday morning so we could see each other in person! Sunday morning came and we went back to the orphanage one last time to share a special Sunday morning Service with them and to give one last round of hugs and kisses. It was a lovely, encouraging, hard, emotional time. To be honest, in the midst of all of that, I forgot that Annie might show up. when a taxi cab drove up and out popped Annie! Gone was the shy girl with a quiet voice, and in her place was a confident young woman, bursting with love and joy and anxious to hear about our trip, our lives and our God! We only had a few minutes together as our team was packing up to leave for the airport, but in those few moments God gave us such a gift! Annie was carrying with her a large picture of our travel group from 2006. The picture was clearly well worn and well loved. On her wrist was a rubber bracelet that one of the families from our travel group had given her. They had sold the bracelets as a fundraiser and then brought them to China to share with our group. Annie asked about each child from our group by name, remembering amazing details about each one. We quickly shared what had happened in our lives over the past 4 years, crying tears of joy as I shared about family members who have come to Christ since we had last been together. It was a joy to hear of Annie's life now. She no longer works for the orphanage or for our host, but is teaching English in Beijing. She and her best friend work and live together, now saving all of their money in the hopes of opening their own English School in the next year or two. Their goal isn't to open just any English School . . . but to open a school where they can teach English, but more importantly, to teach the Truth. She asked if our family would pray for them as they work and save and start this new venture. She asked if we would come back to China and help them serve and share. Of course we'll pray for you, Annie. Of course we'll come back for you, Annie. Will you also join us and pray for Annie? Will you pray that the Lord would multiply their funds and enable them to start the school quicker than they image. Will you pray that the Lord will continue to protect them and allow them favor with those around them, especially the government and other leaders? Will you pray that their faith will continue to grow and grow and that the Lord will continue to teach them and stretch them. And will you pray that maybe someday, Lord willing, you would be willing to go back with us to China to work with Annie and to share and love and teach the Truth?